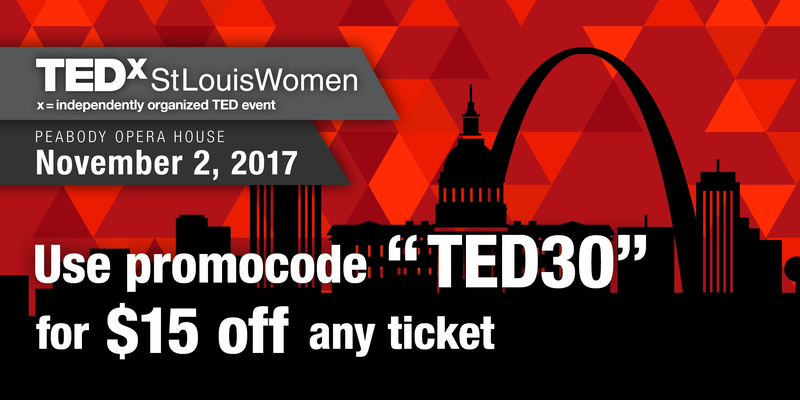 In conjunction with the national TEDWomen 2017, we bring you TEDxStLouisWomen 2017. Need new thinking that you can bring back to work or into your home? Anxious to spark ideas that will impact your professional and personal life? If you haven’t already, circle November 2nd, 2017 on your calendar and bring your team to TEDxStLouisWomen, an extraordinary women’s professional development conference, at the Peabody Opera House downtown. Women make up 47% of the workforce and make decisions every day that will impact their personal and professional lives, as well as those around them. TEDxStLouisWomen is a local event to inspire, connect and arm you with the tools to continue this pursuit. TEDxStLouisWomen is an independently organized TED event, produced by CPG Agency, for the sole purpose of encouraging and empowering women to be the stone that makes ripples in their personal and professional life. In addition to bringing a TED-like experience to those in the St. Louis community, the conference’s key objective is to bring female voices from around the globe to the forefront. This year’s theme is BRIDGES: We build them, we traverse them and sometimes we burn them, for better or for worse. In a time of great divides and expansive challenges, you’ll discover how to navigate bridges in all areas of your life. TEDxStLouisWomen is the largest women’s event in the region. And with great size comes great responsibility. This amazing conference tackles the bold conversations that aren’t typically happening on the main stage and highlights diverse women’s viewpoints in exciting, inspiring ways. “Bridge builders” from around the world take the stage to discuss ideas worth spreading and provide valuable insights that will contribute to your professional success and development. 1. The conversations taking place at this event are glass ceiling breakers and discussions the entire world should be having. This event is not a typical women’s luncheon. This is a women’s leadership and empowerment conference. You come to get your bones rattled. The conversations taking place are ones that encourage today’s women to rise up and cross bridges they’ve hesitated to traverse before. This is the most women we’ve ever had in the workforce in history. Women are world changers, innovators, and their viewpoints are needed now more than ever. With such diverse viewpoints and strengths that we have to offer, this conference hones in on how to access those skills to awaken a more powerful and productive you. These powerful conversations range from mental health, body image, excelling in the business world, and being true to yourself, just to highlight a few. 2. It’s a local event – your networking circle will be KILLER! Create lasting, actionable connections with women from all walks of life. The longer you spend time in the working world, the more you come to realize, it isn’t about what you know, it’s about who you know. What better event to meet passionate, open-minded professionals like yourself than at the largest women’s event of its kind in the region? Learn from the amazing executives from across the region as they share their perspectives on diversity, inclusion and more during a special TEDxStLouisWomen executive session. The connections formed here can last a lifetime. “It was very insightful, informative, and inspirational. I enjoyed it and would attend again!”- Tara Miley, Facebook review. Also, after the conference, there is a networking, cocktail hour that is open to all attendees, and complimentary. This is the perfect opportunity to connect with your local women and discuss what you have learned! Plus, In between speakers, Sarah’s Bakery will be served for your mid-day sweet tooth. 3. The speakers we have lined up this year are going to impact all areas of your life in ways that trigger real change. Samantha is a work/life fulfillment expert, and her work has elevated thousands of professionals. Sam’s guidance on how to maximize work/life success starts by finding that spark within each of us and turning it into a fire. She is a best-selling author, writer for Forbes, renowned speaker and host of a nationally syndicated radio show. Crystal is the CoderGirl Program Director at Launchcode. CoderGirl is an education program of LaunchCode designed to engage and educate women in the technology field in St. Louis, making training and careers in tech easily accessible. As a Detroit Public Schools graduate, Crystal is passionate about equal access to education at all levels. Ann Shoket has been a key architect in shaping the national conversation about and for millennial women. Shoket’s book, The Big Life: Embrace the Mess, Work Your Side Hustle, Find a Monumental Relationship, and Become the Badass Babe You Were Meant To Be is a guide for millennial women who are changing what it means to be powerful and successful in the world – for everyone. Shoket is the former editor-in-chief of Seventeen magazine, a guest judge on America’s Next Top Model, and regularly appears on Good Morning America, Today, CNN, and E! News– to name a few. Keisha is an author, speaker, and social entrepreneur. She is widely recognized in the St. Louis business world for her work launching an education technology platform, Bridgit2college.com. Keisha is also the author of Hey Friend: 100 Ways to Connect with 100 People in 100 Days. Tabatha’s resume is a biography of a natural born hairstylist and business woman – from being chosen as “Fan Favorite” on Bravo’s “Shear Genius” to her successful runs with “Tabatha’s Salon Takeover”. Tabatha is the author of Own It: Be The Boss of Your Life – At Home and In The Workplace and her memoir It’s Not Really About the Hair: The Honest Truth About Life, Love, and the Business of Beauty. These are talks and inspirational women you don’t want to miss. TEDxStLouisWomen is designed to reinforce the values that create these change-makers. There is no role too small to begin your journey into becoming the leader you’re working towards. The bridges you will form at this conference will help grow you into the woman you are working to be. We’d like to send a special thank you to all of our sponsors who are helping make this conference happen. We truly are grateful for your commitment to empowering women and bringing thought leaders to the St. Louis community. For more speaker, program, and ticket information, please visit our website and Facebook page. For $15 off your ticket purchase, click the link below. We hope to see you there!